HBR012 Heating Bolt Remover is 100% Oringal. WOYO HBR012 Heater Rust Converter Remove Rusty Bolt. WOYO HBR012 is the new item from Nandrepair. 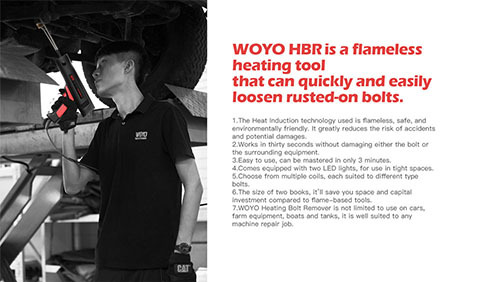 WOYO HBR012 is a flameless tool that can quickly and easily loosen rusted-on bolts. 4. Activate the power swithch to run the heating inductor for 1-3 minutes until enough heat has been applied to the work piece to break the rust/corrosion bond. 5. release the power swith to turn off the power. 7. Turn unit off and allow the unit and all attachments to cool for at least 10 minutes, Handing the unit or parts before they have cooled may result in injury. 8. Make sure the unit is turned off and unplugges, After cool enough, use a dry, clean, non-abrasive cloth or pater towel to remove grease, Oil, and other dirt from the heating inductor and electrical lead before returning them to the storage case, storage of unit while still hot may resut in damage to equipment or pose a fire hazard.